ResQCPR™ Pump & Pod - Advanced First Aid, Inc. 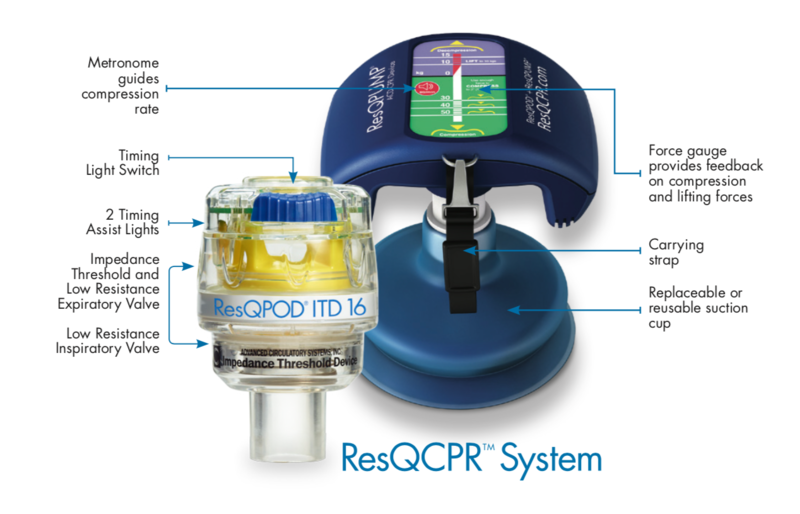 The ResQCPR™ System is comprised of two synergistic devices – the ResQPOD® Impedance Threshold Device (ITD) 16 and the ResQPUMP® Active Compression Decompression CPR (ACD-CPR) Device. The ResQPOD regulates air ow during the chest wall recoil phase of CPR to enhance the vacuum in the patient’s chest. This results in more blood being returned to the heart (preload) and a lowering of intracranial pressure (ICP). The ResQPUMP further increases blood return by actively re-expanding the chest to further enhance negative pressure. It is the only device FDA-approved for delivering ACD-CPR with a lifting force of up to 10 kg.